Dogs make for great paddling companions, as they don’t complain about the rain, argue about the route to take or grumble about whether or not the tent is put up correctly. They have a low centre of gravity so won’t topple into the water easily, and they are the perfect water bottle for the cooler canoeing sessions. The only bad thing about going canoeing with your dog is once you start you won’t ever leave them behind again! If you are thinking about bringing your dog with you when you go canoeing, there are few things to consider beforehand to ensure your pooch will have as much fun as you when out on the water. First being that the canoe you have is suitable for your dog. Larger, family size canoes are best, as there will be enough space for your dog. You should avoid metal canoes too, as they can get very hot in the summer and uncomfortable for the dogs’ feet. You should also get a covering for the floor of the canoe, to avoid the dog slipping around and being unable to settle down. Several of our canoes for sale are great for dogs, and we also have starter packs available too so that you can get more equipment in one! A lack of training both for yourself and your dog can lead to safety issues even on flat water. You should be a confident paddler yourself before taking your dog out with you as if you are uncertain and inexperienced you could quickly get into trouble your dog can’t help with. Your dog will also need some training too, as not all dogs take naturally to water. Make sure they are well trained with commands and take time to get your dog used to being on a boat when you are still on dry land. Remember to be patient, consistent and rewarding with your training as this will ensure you can both have great fun in your canoe! Think about how the breed of your dog could affect your paddling experience. Large, excitable dogs can capsize canoes, but they also provide protection. Dog breeds which love water are great, as they are less unnerved about being around water for long periods of time. It also helps if they can swim too, but it is not necessary. The temperament of your dog also has an impact on how they behave on the water. Minor situations can become major problems if your dog reacts in a bad way. This is why training is important before you get onto the water! Every time you go paddling, make sure your dog has a life jacket, leash for time spent on land, water and drinking bowl. If you are on an overnight canoe trip, you also need to bring food and a bed and make sure you have a dog first-aid kit with you, just to be safe. A PFD or life jacket is essential for going out on the water and are required no matter how good a swimmer your dog is. It also provides thermal protection and has a handle should you need to lift your dog out. Another essential is poop bags if you don’t find a good place to bury it on land or can’t get to land to let them do their business. A routine might not be suitable for all dogs who paddle but implementing one can help you too. Your routine can include giving them a quick run around before setting off, so they calm down, letting your dog in and out of the boat first and stopping them from barking so they don’t disturb any wildlife. For longer trips, try stopping every so often so everyone can stretch their legs and your dog can do their business. Have short leashes ready too for going on land or in the water. Dogs are good at sensing our emotions, and if you stay positive about your adventure, they are more likely to have a good time themselves. 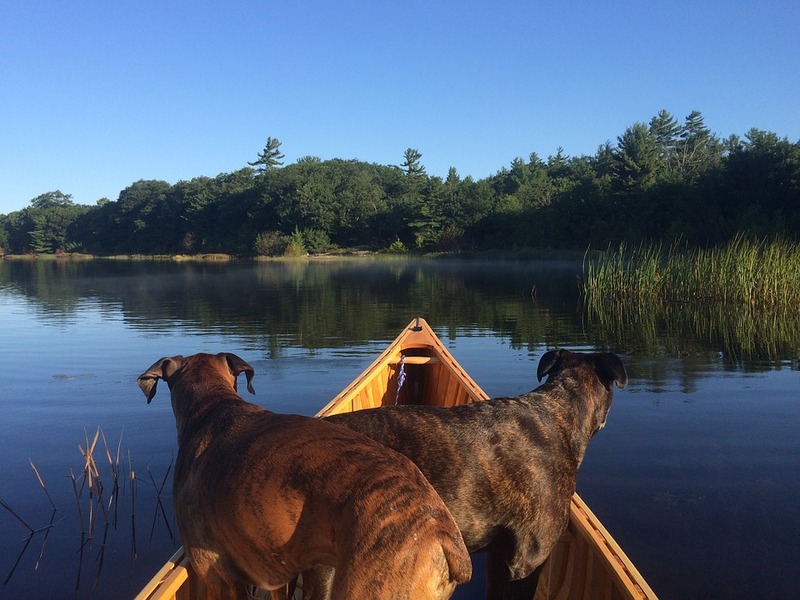 Start small on your adventures, so your dogs can get used to joining you on your canoe, and reward and praise them when they behave well on the trip. Take lots of pictures too so that you can remember your adventures afterwards.